Last month I interviewed top PR and social media experts about the challenges facing online marketing. The following recap includes some of the juiciest quotes from Neal Schaffer, Frank Strong, Drew Neisser, and Deb Weinstein. I also share my views (not necessarily the agency’s) and pose additional questions. Finally, I include links to other stories I’ve seen on the topic. Please continue the conversation and chime with thoughts, comments, and questions. Are the social media waters still safe for marketing? Frank Strong: It’s a question of whether or not your customers and prospects are on social media. If they are, then there’s a pretty good chance you still need to be there too. Drew Neisser: What’s not safe is ignoring social conversations, especially those related to your brand and category. 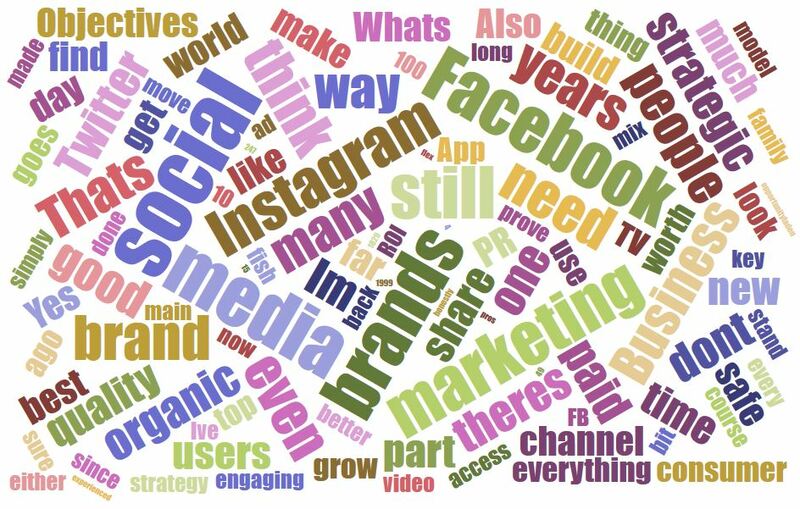 Interestingly, brands that take a stand, even a controversial one, are generally way ahead of those that sit on the sidelines Neal Schaffer: I think it is getting more and more intrusive for brands to try to take part in the conversation. I’d say caution is needed until some of the challenges are addressed, and you should make your choices based on your channel and niche. Also, the devil is in the details. Is it OK to use some of the same levers as the Russian misinformation campaigns, e.g to push emotional hot buttons, and in other ways game algorithmic results? Or leverage the personal data that people are so up in arms about? Have you been recommending a change in strategy regarding social media? Neal: Definitely. An influencer component should become part of the mix. Frank: Organic efforts alone probably won’t cut it for most. You need to be both engaging and worth engaging. Too many brands still operate in output-only mode and then wonder why no one has noticed. Drew: First… you must have a paid strategy to support your organic efforts. Second, you need to have very different strategies for each channel. Third… we’re recommending brands focus more on quality over quantity – since only the best stuff will rise to the top. I am not actively pushing Facebook targeting campaigns right now (most of our clients are in the B2B tech space, so Facebook is less important anyway). On the other hand, we are becoming more active with messaging platforms. What comes after social media? Deb Weinstein: We have reached a tipping point… where the sum of a campaign’s parts are far greater than its individual components and it has never been more important for brands to completely integrate every aspect of their brand-building (and protection) activities to achieve optimal impact. This means not relying on social media or any one channel. Frank: This question implies that we are writing the epitaph on social media platforms and I don’t think that’s true. Marketing has evolved and will continue to evolve… there are several new tactics worth watching: Voice as a user interface… Amazon ads… [and] businesses have to find ways to bring better content to market faster without sacrificing quality. Drew: Social will evolve both as an organic and paid channel and of course, new social networks will arise. In particular, expect to see smaller affinity networks that meet both virtually and physically. Frank: There’s always been disinformation. You could (and they did) spread rumors in ancient Rome the same way you could on a web bulletin board in 1999. Drew: Who said the ship is listing or sinking? Despite all of the controversy around Facebook this year, usage levels are still extraordinarily high and marketers are still finding it to be a very effective advertising channel. I don’t know, it took us a long time to get here, and it will take a lot to fix the mess (see my post which outlines one radical way). I am not sure I agree with those who just look at it from an ROI perspective, or being where customers and conversations are. The medium is the message for Chrissakes. “Place” is one of the 4 P’s of marketing – and if the place has become a cesspool do you want your brand to be doing much there? (I am not saying it is quite that bad: yes the media does hype the problems – but it is a question worth pondering). What does it look like, from a brand safety perspective, to run campaigns adjacent to the scammers? Or feature your news in places dominated by sketchy info? Is Facebook still a good place to invest in social media marketing? Neal: Absolutely! I tend to invest more in Instagram knowing that that’s where brands are, and where businesses look for influencers Frank: The disinformation on social media certainly changes the way I share and consume information on social media. As the old adage goes, trust, but verify. That’s not just for reading but also for attribution in sharing.